Refuse disclosure of what’s in their products. Pollute our air and water while avoiding government inspections. Force chain stores into locations where communities don’t want them. Avoid subpoenas for price fixing or unlawful trade. Refuse birth-control to employees, based on the company’s religious rights. SJR19 makes a weak attempt to address the campaign finance aspects of today’s problems, but we need to put our Constitution back to what our Founder’s intended. Fortunately, on June 18th, another step in the right direction was taken by a subcommittee of the Senate Judiciary Committee. Here is the improved language. But it still falls short of what is needed. Move To Amend cannot support an amendment that doesn’t end corporate constitutional rights and makes explicit that money is not speech. This proposed language permits regulation of these issues but doesn’t require it. We would like to see the Senate adopt more definitive language, like that found in the Move To Amend “We the People” amendment, HJR29, which was introduced last year in the House by Mark Pocan and Rick Nolan. In addition, we would like the Senate to introduce our HJR29 amendment into the next session of Congress. Madison, WI (April 1, 2014) – On Tuesday, April 1, 13 communities voted in favor of amending the U.S. Constitution to make clear that corporations are not people and money is not speech. These two ideas were the basis of the Supreme Court’s Citizens United decision, which opened the floodgates to big money in elections. All 13 referenda passed with solid majorities: Waukesha (69%), Wauwatosa (64%), Whitefish Bay (65%), Shorewood (76%), Waunakee (79%), Edgerton (87%), Lake Mills (73%), Elkhorn (69%), Delavan (76%), Belleville (85%), De Forest (70%), Windsor (71%) and Waterloo (61%). This brings the total number of communities in Wisconsin that have called for an amendment to 41. In the country as a whole, 16 state legislatures have voted for an amendment, as well as over 500 towns, cities and other organizations. Polls have shown widespread disapproval of Citizens United among Democrats, Independents and Republicans, and strong support for an amendment to reverse it. Madison, WI (March 31, 2014) – On Tuesday, April 1, Wisconsin residents in 13 communities will vote on whether to amend the U.S. Constitution to make clear that corporations are not people and money is not speech. Voters will cast ballots in Waukesha, Wauwatosa, Whitefish Bay, Shorewood, Waunakee, Edgerton, Lake Mills, Elkhorn, Delavan, Belleville, De Forest, Waterloo and Windsor. If all vote in favor, this will bring to 41 the number of Wisconsin communities and governmental bodies that have called for an amendment. Nationwide, 16 state legislatures have done likewise, as have over 500 towns, cities and other organizations. The language of the amendment would effectively reverse Citizens United, the Supreme Court’s 2010 ruling. Polls consistently show widespread disapproval of Citizens United among Democrats, Independents, and Republicans. Politicians from both major parties have called for reforms. Over a century ago, another Republican and Wisconsin’s most celebrated progressive, Robert M. La Follette, spoke out against corruption wrought by the ‘concessions and privileges’ accorded to corporations by legislators. His question posed in an 1897 speech resonates today. 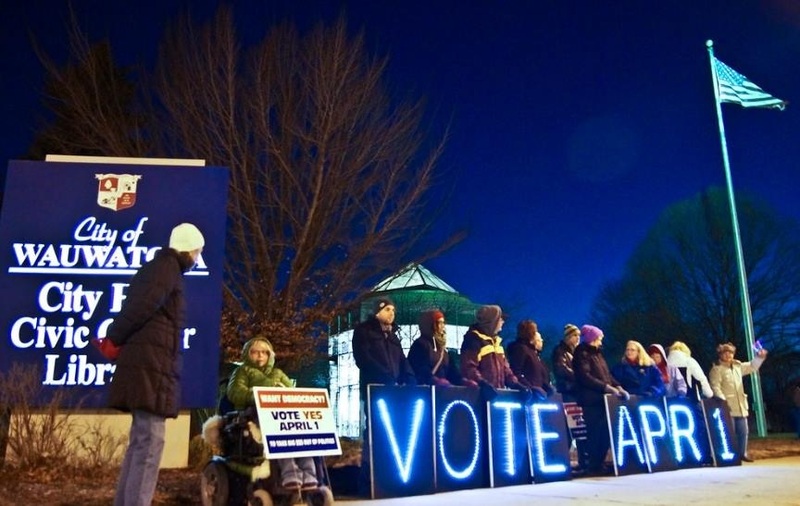 A major milestone in Wisconsin’s fight to overturn Citizens United! I encourage you to watch (and share with others) the complete press conference announcing the bill, featuring United Wisconsin’s Lisa Subek, WISPIRG’s Bruce Speight, Rock River MTA’s Dr. James Hartwick, Wisconsin Business Alliance’s Lori Compas, and Wisconsin State Representative Chris Taylor. contact legislators and write letters to newspapers urging passage of LRB-1457/5. Remind them that this bill is simply about letting voters decide! if you haven’t done so already, please add your name to the Wisconsin United To Amend Petition. MoneyOutVotersInWI is a coalition of Wisconsin groups fighting the corrosive effects that unlimited campaign cash has on our political system. Over 18,000 Wisconsin citizens have already added their names to this petition, demanding that the Wisconsin Legislature place an Advisory Referendum on the ballot in Wisconsin directing the Congress to amend the U.S. Constitution to end the notions that money is speech and corporations have the same rights as human beings. The Money Out Voters In WI press conference is set for Wednesday, July 24th at 10:30am at the State Capitol. If you can make it, please come – it’s important to show the reporters who attend that this has lots of support! We will also need people to stand behind the speakers holding signs, so if you want to do this be sure to come dressed appropriately. 2. Money is not speech, and therefore limiting political contributions and spending is not equivalent to restricting political speech. By the way, one of the speakers will be James Hartwick from the Rock River MTA Affiliate. We are still lining up the other speakers. The 2010 United States Supreme Court decision in Citizens United v. FEC overturned 100 years of precedent by legalizing unlimited corporate involvement in elections. This ruling now allows corporations to be treated like “persons” in campaigns, thus giving more power to large, faceless entities, and undermining Wisconsin’s proud progressive tradition of open and honest government. Thanks in large part to Citizens United opening the floodgates to unlimited spending, the last election cycle cost $5.2 billion, much of which came in massive, untraceable donations from a few billionaires and giant corporations. In Wisconsin’s House and Senate races, $32 million was spent by outside interest groups, and nearly 36 percent of that total was completely untraceable. The vast majority of Americans oppose the Citizens United ruling. A recent AP / GfK study showed that 83 percent of Americans — including 81 percent of Republicans, 78 percent of Independents and 85 percent of Democrats — want limits on the amount of money corporations, unions and other organizations can spend to influence elections. Over 18,000 Wisconsinites have signed a petition calling for a citizen’s vote on putting Wisconsin on record against Citizens United. Thirty-two organizations from around the state have formed a coalition calling for a statewide referendum. The passage of LRB−1457/5 would create an advisory referendum that would appear on the November 2014 ballot. The referendum would give the public the opportunity to share their opinion on this issue with their elected officials. If the proposed ballot initiative passes, Wisconsin would join 16 states that have already gone on record for a constitutional amendment to limit election spending. 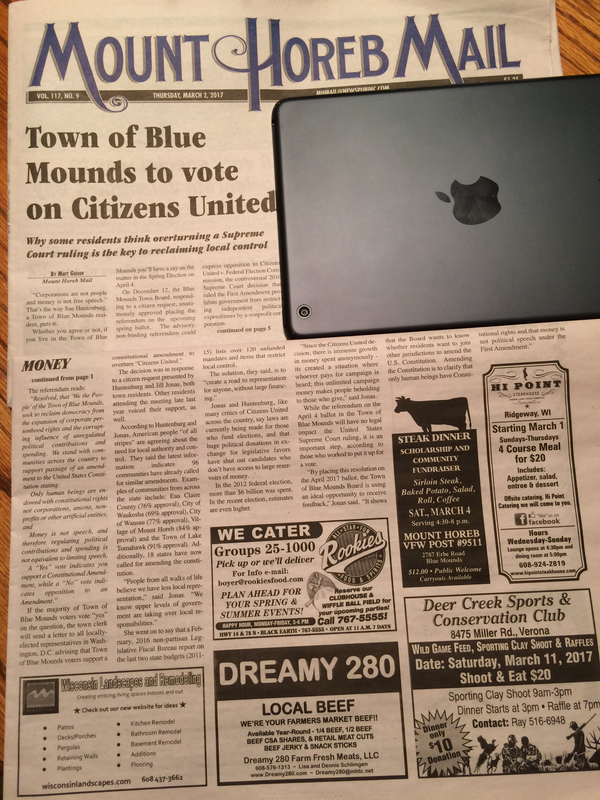 Exeter WI becomes first Township in Green County to pass a resolution declaring that money is not speech and corporations are not people. At the July 9th town meeting last Monday night, after four months of town input at the monthly meetings, the board, in a unanimous vote, passed a resolution asking the U.S. Congress, State legislature, Governor and President to support an amendment which would reverse the Supreme Court decision, Citizens United vs. The Federal Election Commission decision. The decision granted artificial entities such as corporations and unions the same constitutional rights as natural persons, and equated free speech to money. The resulting flood of campaign cash has corrupted our political process, making our representatives beholden to a small group of moneyed special interests. 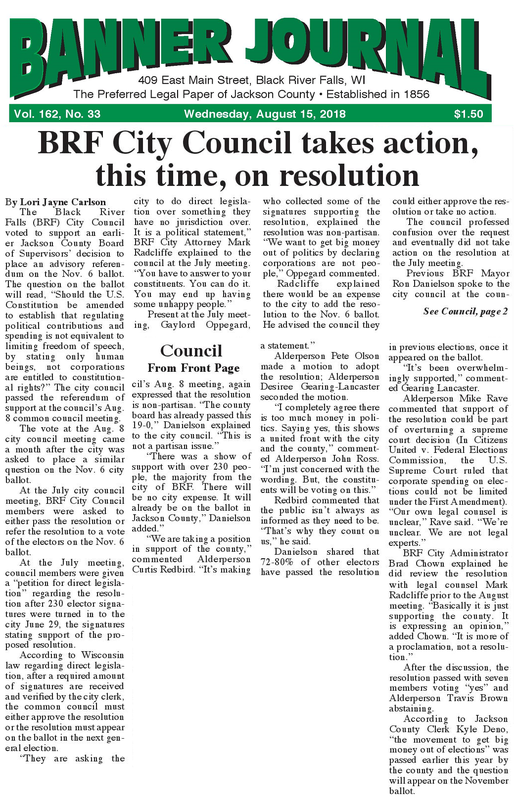 The action in Exeter comes two weeks after the vote by the Village of Belleville board to “Let the people vote” after a successful direct legislation petition by area citizens, the Belleville board had the option to pass a similar resolution or to have a referendum at the next general election in the spring of 2014. Another unanimous vote, this time to let the people vote. 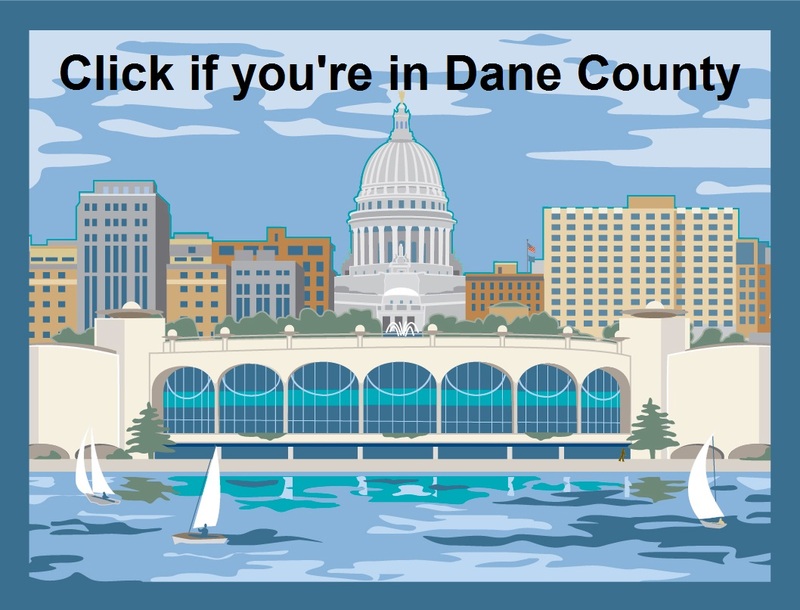 Exeter becomes the eleventh community in Wisconsin to pass a “We the People” style resolution, joining Madison, Dane County, West Allis, Westport, Dunn County, Eau Claire County, Chippewa County, Fort Atkinson, Whitewater and Douglas County. Nearly 500 towns, cities and other organizations across the U.S. have done the same, including sixteen state legislatures. 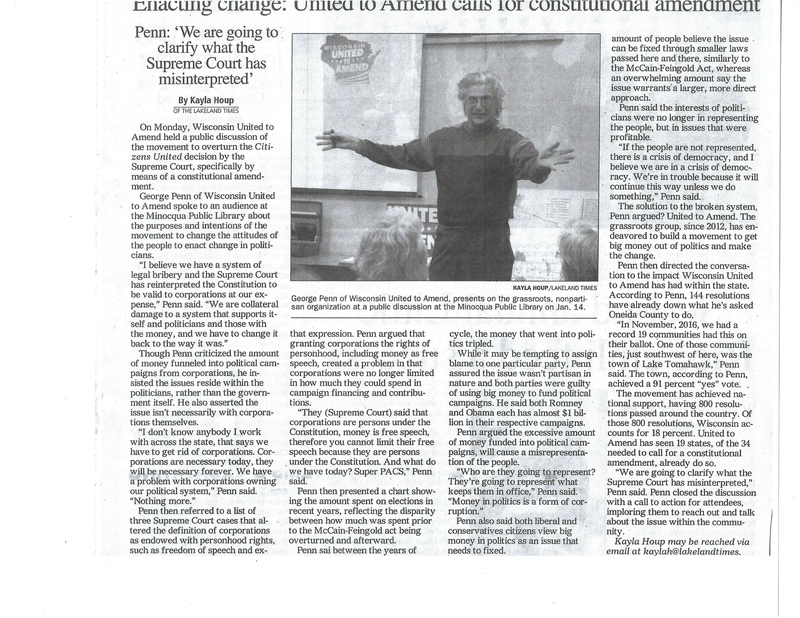 Local Move to Amend volunteers in the Green County area ( MoneyOut.wordpress.com ) and our allies at South Central Wisconsin Move to Amend, ( SCWMTA.org ) would appreciate the opportunity to present to your organization or small group of citizens, a slide presentation and discussion on our movement and Citizens United effects on our Democracy.